Sun-Wed noon-5pm; Thu noon-9.30pm; Fri, Sat noon-10.30pm. 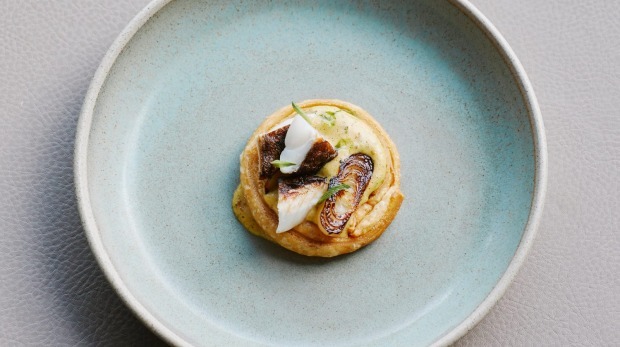 ​Time to put your hands together and make some noise, ladies and gentlemen, for Phil Wood, the chef making waves in Victoria's great south-east. 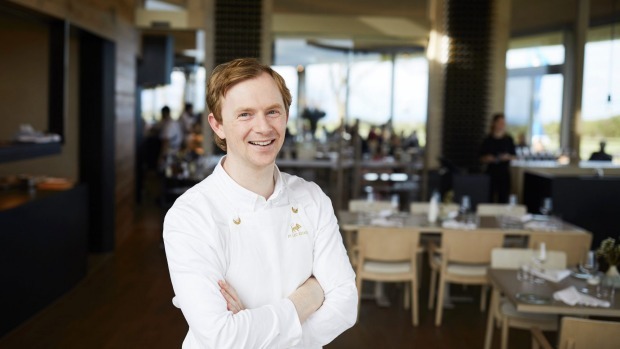 Yes, true, Wood has been on the Mornington Peninsula since November, when the Gandel family lured him from Neil Perry's closing Eleven Bridge (formerly Rockpool Est. 1989) to their $40 million sculpture park and restaurant at Merricks. And sure, he hasn't pulled punches in the Pt. 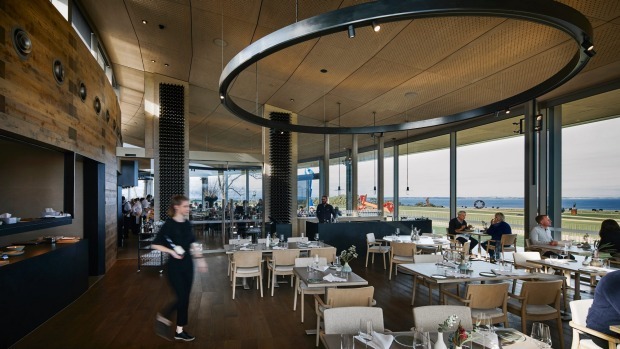 Leo dining room (eating the carrot souffle dressed with scampi roe, in a room girt by sculpture and sea, is hardly slumming it). But it's only now Laura, a 45-seat fine diner, has been loosed that we're getting full-throttle Wood. Is the gap between the venues so great? Separated only by glass, with similar colour schemes, it might not seem so. But step beyond Pt. 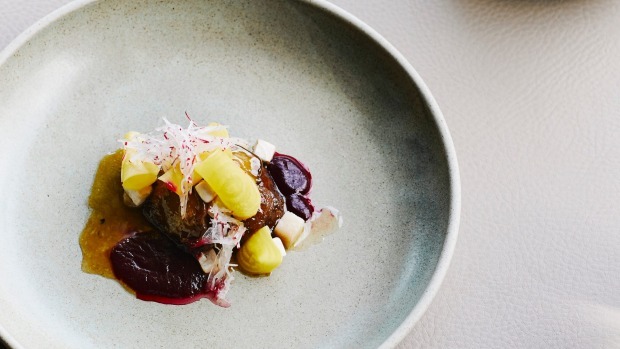 Leo's dining room, where flames shoot out of the oven and chefs wear radio headsets, and you'll find Laura, a peaceful terrarium, dressed a lot like Maggie Beer. It's a vision in creams and taupes. Soft, pale leather coats tables laid with spindly Cutipol cutlery. Woven fabric covers chairs with sturdy blondwood arms, and while Pt. Leo diners get Riedel, here it's elegant Zalto stemware that costs half as much as your lunch. That lunch (or dinner), is four to six courses, each focusing on the peninsula's perks: its dairy and vineyards, its land beasts and fish. Kick-off sees local hand-milled flour turned wholemeal brioche. It's nutty, egg-rich and barely sweet, like a savoury cake, served with a luminous olive oil from just beyond the gates. Then, round one, a mushroom that almost isn't. The fibrous, almost meaty lion's mane 'shroom is fried and glazed in a salty-sweet teriyaki-style liquor (just like a chicken wing, says Wood) until earthy, chewy and caramelised. It's crazy richness tugged back into opening dish territory by an acid-bright beetroot liquor, and a mixed dice of abalone and button mushrooms, which add mellow and fruity notes. Welcome to lunch. By now you've realised this isn't produce-driven cooking in the sense of oiling a tomato and voila! Instead, it's showing what south-east produce can look like when run through the mind and hands of a (justifiably) confident chef. Wood plates more elements together than you'd trust almost anyone else to. See the lacy duck egg omelette, surrounded by daubs of bone marrow, a meaty veal stock, freckles of broccoli and crisp, fried potato petals. This is the "vineyard" dish, and the point of it is none of the above but the radish-rich tannic red wine sauce underneath it. Complicated? It's got more concurrent storylines than Game of Thrones, and yet every element rings through, distinct. So Wood can cook. But we knew this. What's interesting is the way he has chosen to cook now that he's taking cues from the Mornington Peninsula rather than Neil Perry. He still loves seafood (though it's ironically tricky to get here), and Asian ingredients (more Japanese now than Chinese). But produce is the story and Wood's using classic technique to tell it. The sound emerging from the kitchen isn't Pacojets or roaring grills but the scratching of balloon whisks on pans. 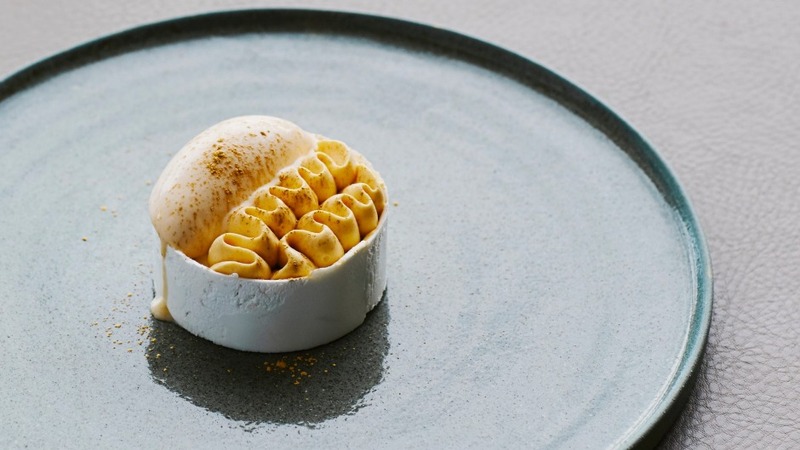 See all of this translate into a fish pie: bronzed fillets of firm duckfish and a baby onion, pickled and grilled, luxuriating in a nori-speckled almond sabayon, contained by a crisp pastry lasso. It's the unmistakable taste of hot buttered ocean. 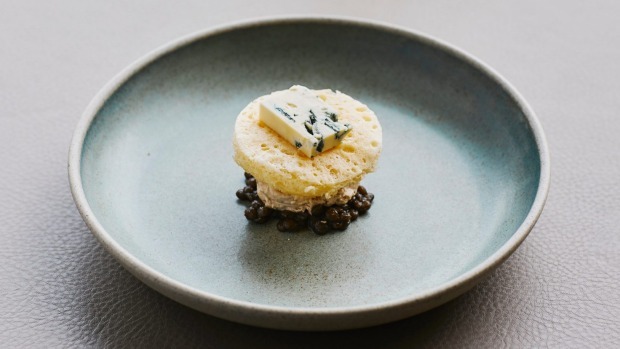 A textbook beurre blanc is the sparkly cheerleader for a Hawkes Farm nicola potato, filled with cream, grilled and topped with Yarra Valley trout roe and Italian caviar. So there's luxury. But in spite of the cool $40 million worth of sculpture outside, Laura isn't showboaty. The kitchen is calm. You can only just hear the gentle remix of Peter Bjorn and John's Young Folks. Service is attentive, amazing if manager Ainslie Lubbock drops by, but otherwise nicely unobtrusive. I take that back when it comes to the theatrical main duck course. Two plummy slices of burnished Great Ocean Road duck breast, cooked on carcass, arrive on one plate with a black bread loaf on the other. It's a tomb whose lid is removed to reveal a carrot-wrapped chicken sausage stuffed with the shredded duck leg. Another waiter swoops with a posy of herbs and greens you might use to paint your meat with a chicken liver Tuscan gravy. I like that Wood starts complex and crescendos with a fancy roast as your brain melts. It's considerate. So is the wine match encompassing the bold (an earthy Moriki Shuzo sake to draw the fruitiness and umami from that mushroom dish), the beautiful (Andre Bonhomme's 2015 white Burgundy to party with the pie) and the hyper-local (Point Leo Estate's own 2013 pinot noir). The ridiculously delicious cheese course plonks a bitey wedge of Berrys Creek blue on a sponge disc, over boozy pear cream bedded on lentils (!) that give it all a bit of a red bean dessert vibe. For dessert, Thanksgiving meets pavlova in a festival of spiced pumpkin creme diplomat, gingery chopped chestnut, shiitake ice-cream and construction-crisp meringue. Welcome to the 'hood, Wood. Cost: Four courses $120; five $130; six $140. Open: Thu-Sat noon-10.30pm; Sun noon-5pm. Drinks: Estate wines, old and new guard producers, both local and international. Pro Tip: Go for lunch to tour the sculptures including namesake, Jaume Plensa's Laura. Go-to Dish: Lion's mane mushroom glazed like a wing, with abalone.